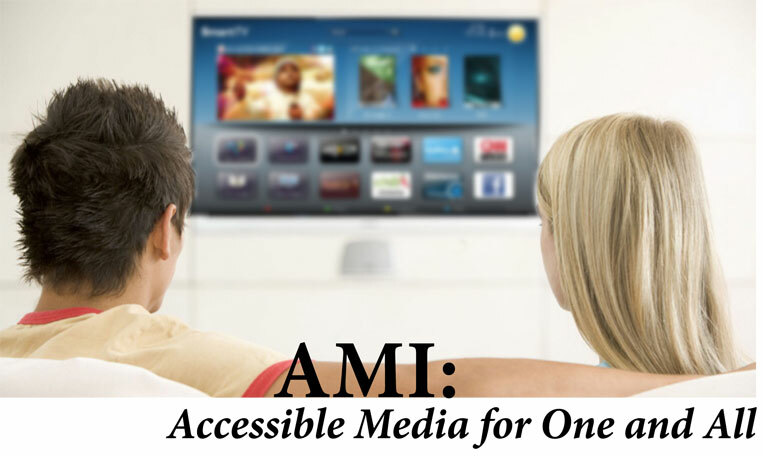 Accessibility has become a popular watchword in disability circles, but Accessible Media Inc. (AMI) has ventured beyond clichés, proving itself as a true advocate and pioneer in providing broadcast accessibility services to a growing number of vision-impaired and blind Canadians. The devoted professionals at AMI provide programming over multiple platforms, including described video for television, audio programs and original media content. AMI President and CEO David Errington, highlights the fact that AMI is the only television network in the world with open description for television 24 hours a day, seven days a week. Most sight-impaired people need to use the Second Audio Programming (SAP) channel in order to access described video, whereas on AMI, access to described video is automatic. Other stations are mandated by the CRTC to have accessible content for a mere four hours per week. “The majority exceed that, but not by a huge amount,” he states. All of AMI’s television programming is captioned. In addition to television, the organization provides extensive audio services such as audio files – essentially, an audio “transcript” – on CBC Newsworld’s SAP channels. The AMI website (www.AMI.ca) hosts audio services, and video programming is being planned. Researchers estimate that more than one million Canadians are living with blindness or a significant loss of vision. What’s more, the total number of visually impaired and blind Canadians is projected to double over the next 25 years, due to a combination of increasing rates of age-related macular degeneration and the greying of the population. “We’re outliving our eyes,” said Errington, a haunting phrase that makes one appreciate the ability to see. This spirit of inclusiveness is so strong at AMI that it insists on providing meaningful content to individuals without a disability: good content is good for everyone, it maintains. AMI bases its programming choices on carefully thought-out feedback mechanisms like consumer panels, surveys and focus groups, which keep it connected to the public and spark conversations about media-related issues. What does the future hold for AMI? The group has applied for a license for French TV service, and hopes for a response soon. If the license is granted, AMI TV Français would launch in January 2015. Errington has nothing but praise for the way in which accessibility has been embraced in this country. “The Canadian broadcast system is definitely a world leader in this regard.” As he travels abroad in search of new programming, his continued efforts elevate broadcasting to a level that meets the intellectual and creative expectations of a discerning media-consuming public. This entry was posted in Legal Angle by Envision Magazine. Bookmark the permalink.